Why wait for a better battery when you can just add an ultracapacitor? The newest Ioxus ultracapacitor (ultracap or u-c) comes with an impressive number: 12 percent. Why it is impressive in a moment. The current Ioxus ultracap is now in use in hybrid buses, fork lifts, heavy duty equipment starting, backup for uninterruptible power supply applications for data centers and wind turbine pitch control, according to Ioxus founder and Vice President of Sales Chad Hall. What all these applications have in common is they require relatively large bursts of power from a quickly and frequently recharged source. Serving that function is what distinguishes an ultracapacitor from a battery. 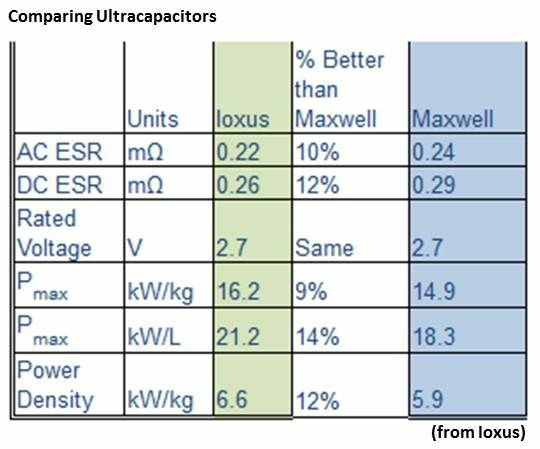 Potential ultracapacitor applications are much broader, probably the most important being in their potential to partner with advanced batteries to give plug-in vehicles more range. Ioxus had a banner year in 2011. “Product bookings increased seven times from 2010 to 2011,” Hall reported. In the coming year, he anticipates wind turbine applications to be 40 percent to 50 percent of sales, hybrid bus applications to be 30 percent and the remainder to be in materials handling and LED lighting. Hall said the company foresees a 56 percent annual growth rate for the industry through the coming decade, moving global ultracap buying to $1.16 billion by 2015 and $7 billion by 2020. In a car, the first concern is miles per charge. “You would get a couple of miles out of the ultracapacitor, whereas you might get a hundred miles from a battery.” But a plug-in car’s battery pack must also provide power. Engine functions such as starting and acceleration require power, and power needs increase as a battery’s charge is drained. Today’s sophisticated 2.5-megawatt and 3.5-megawatt wind turbines are designed to be turned into the wind with precision by onboard computer systems. The 80-meter to 120-meter long blades must also be positioned to carve the fullest potential from that wind. Precise repositioning may be required very quickly by a sudden wind variation. Ultracapacitor-powered motors do that work. “They take our 16-volt, 58-farad module. [There are] 90 of them per blade, 270 modules per windmill, 600 volts running at 30 or 40 amps. And they do that on a very high-cycle basis,” Hall said. Exerting power quickly to move the blades can drain the modules, but they can be recharged quickly with a small portion of the electricity the turbine generates. 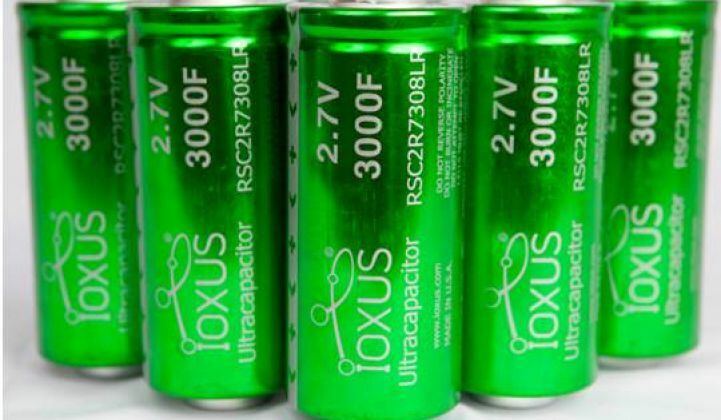 Ioxus has just brought to market its newest ultracapacitor: a 2.7-volt, 3,000-farad cell. Hall said it is improved electrically, mechanically and thermally. Here comes that impressive number. Hall said the “closest competition” primarily includes Maxwell, the ultracapacitor industry leader, and NessCap, an up-and-coming Korean firm. Mechanically, a new three-option interface terminal allowed the iCAP, according to Hall, to become the first ultracap documented to pass the military’s random drop test by remaining functional through 45 minutes in a random drop tester. Thermally, the reduced ESR means less power-generated heat, a reduced cooling requirement and an overall system that is lighter and more affordable.